For obvious reasons, the most apparent physical changes brought on by pregnancy occur in the abdominal area. When carrying a child, the abdominal muscles typically become stretched and pulled apart. After delivery, it is difficult for many women to achieve a flatter, more toned-looking stomach even if they undertake rigorous diet and exercise routines. Additionally, fat deposits can accumulate in the midsection and other areas of the body during and after pregnancy that do not respond well to exercise and diet programs. These issues can be effectively treated with abdominal surgery or liposuction procedures. In fact, they are some of the most commonly performed procedures in a Mommy Makeover, and can help restore your pre-pregnancy figure. Please contact Dr. Tom Lintner to schedule a consultation for procedures that can help you restore the look of your tummy as part of a mommy makeover. For so many moms, the abdomen is such a bone of contention. There are several procedures we can do that help recontour your abdomen. These include panniculectomy, abdominoplasty, and modified abdominoplasty. A panniculectomy (or “pannic,” for short) addresses excess skin and fat only. An incision is made low on your abdomen, and usually can be hidden with a boy short or moderate coverage bikini bottom. During this procedure, excess skin and fat between the incision and belly button is removed. Skin between the belly button and breasts is then redraped over the entire abdomen, the belly button is reattached, and the wounds are closed. Some women—generally those who have had multiple pregnancies in a short period of time—experience weakness in the fascia (the tissue that envelops the muscle and gives it strength and form) that cannot be repaired with exercise. The abdominoplasty procedure is intended to restore a better shape to the muscles and create a flatter, more pleasing tummy. In this procedure, the abdominal muscles (rectus abdominus) are exposed, then loose muscles are tightened using a Shouldice type repair, which essentially resembles a corset lacing, pulled very tightly. Dr. Lintner does not perform any surgical repair to the abdominal muscles beyond correcting any weakened areas. Conversely, if the entire muscle fascia is weak, he will repair all of it. Very few women need a full abdominoplasty. A tummy tuck, in the truest definition of the word, is a full panniculectomy with a full abdominoplasty. Again, most people don’t need all of both. Another option, for those who have very little excess skin and fat but have muscle weakness, is what we call a modified abdominoplasty. Through an opening slightly longer than a c-section incision, we repair the muscle defect and remove a minimal amount of skin. The navel is elevated from underneath and reattached with no external skin incision. A better way to understand this procedure is if you were trying to straighten out your sheets from the foot of your bed without taking off the comforter. Not many women are candidates for this procedure, but it can be a wonderful way for qualified patients to get their pre-baby tummy back. After abdominal surgery, recovery typically takes about one to two weeks before you are feeling mostly back to normal with activity restrictions lasting anywhere from 6-8 weeks. These procedures require drains for anywhere from one to three (sometimes four) weeks, and it is patient dependent. Drains are never meant to be punitive—they are intended to help you heal more successfully. We will provide you with more specific recovery information, which will depend on how many other procedures are involved in your mommy makeover. Dr. Lintner will go over all aspects of your procedure and your recovery with you at your initial consultation. For the tummy region, if the problem is mainly excess fat deposits (as opposed to loose extra skin), Dr. Lintner can perform abdominal liposculpture. The procedure involves the removal of fat cells with the use of long thin rods called cannulas. The cannulas are slowly moved back and forth under the skin, suctioning out the extra fat and giving the area a newly contoured look. In some cases, Dr. Lintner may recommend against liposuction alone. For example, skin with stretch marks can occasionally look much worse after liposuction, because the skin cannot retract with removal of the fat. Liposuction is also not a cure-all for cellulite and can sometimes make that appear worse, as well. Dr. Lintner often suggests liposuction as a accompaniment to certain skin removal procedures, to improve the contour of the treated areas. Although it is easy to see your new contour very quickly after liposuction, final results typically are not seen for several weeks. Liposuction can work wonders for restoring an array of body areas to your pre-pregnancy physique. Will I be able to get pregnant after a tummy tuck? Although Dr. Lintner typically advises against undergoing a tummy tuck procedure before you have completed your family, it should still be safe for patients to become pregnant after this surgery. However, it is important to note that a future pregnancy can potentially recreate the aesthetic concerns that were corrected as part of the initial tummy tuck. If desired, revisional surgery can correct any concerns that arise. Pricing for a tummy tuck will vary for each patient, since this procedure is customized to meet your specific needs and goals. Depending on the scope of the surgery, in addition to the surgeon’s fee and anesthesiologist’s fee, Dr. Lintner can provide you with a personalized quote during your initial consultation. Information regarding available financing options can also be made available, if needed. How do I know if I need a tummy tuck, or just liposuction? Depending on your individual concerns, Dr. Lintner can create a customized treatment plan that is most appropriate for you and avoids being more invasive than necessary. If your main concern is limited to stubborn pockets of fat, liposuction alone may be the best option. However, if excess skin and/or loose musculature are present, he will assess your concerns and recommend either a panniculectomy or a full, partial, or modified abdominoplasty. Dr. Lintner takes great care to ensure any residual scarring after a tummy tuck procedure is as inconspicuous as possible. Although the scar should gradually fade over time and can often become virtually unnoticeable, the incision should result in a scar that is easily be concealed by most undergarments and swimwear. 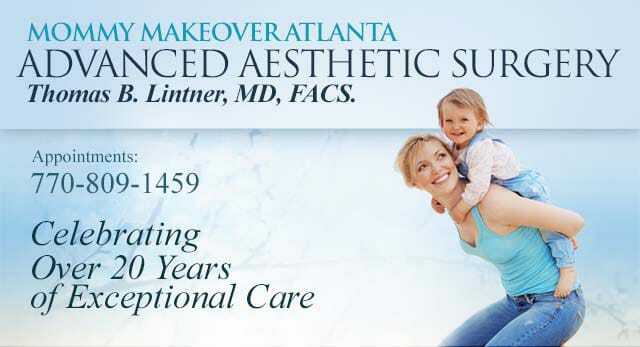 Contact Dr. Lintner to find out more about incorporating liposuction and/or tummy tuck surgery into a comprehensive mommy makeover procedure.